Just like our Sun will five billion years from now, KIC 05807616 ran out of hydrogen and expanded into a massive red giant, wreaking havoc on its solar system. The results might just be the planetary equivalent of cell division. 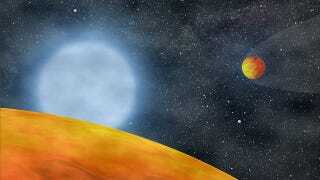 We first noted the discovery of planets KOI 55.01 and KOI 55.02 back in December. They are the first known exoplanets that are smaller than Earth, and their position close to the dying KIC 05807616 means they were once actually inside the outer shell of the red giant. The initial explanation for this was that these two stars were remnants of gas giants that had had their outer layers burned away by their star's blast furnace, leaving behind these tiny cores as essentially brand new planets. One planet, a gas giant about five times the mass of Jupiter, held on for dear life. As the red giant engulfed it, it lost energy through friction, spiralling ever closer to the star's dense, million-degree core. If it could just hang on until the star's outer layers swept back over it as they collapsed onto the star again, triggering helium fusion, maybe it would make it. But it spiralled too close, and got pulled apart by the star's gravity, splitting into daughter worlds in a process reminiscent of cell division. That's the explanation favored by Noam Soker and Ealeal Bear of the Israel Institute of Technology. So why do they argue for an unprecedented phenomenon as the most likely explanation for what's going on around KIC 05807616? The smoking gun, they say, is the synchronized nature of the two planets' orbits, which would be difficult to explain as the aftermath of two separate planets being chaotically ripped apart inside a red giant. What's more, this massive giant's destruction and splitting would have caused the star's gas to evaporate and reduce the size of the red giant, which neatly explains the diminished sized of KIC 05807616. For more, check out New Scientist's Astrophile page. Original paper at Astrophysical Journal Letters. Illustration by Stéphane Charpinet/Institut de Recherche en Astrophysique et Planétologie in Toulouse, France.